Spanish lustered pottery was by far the most sophisticated kind of ceramics produced in 15th-century Europe. It was much in demand by Spanish noble families, but also exported to Italy and other countries. 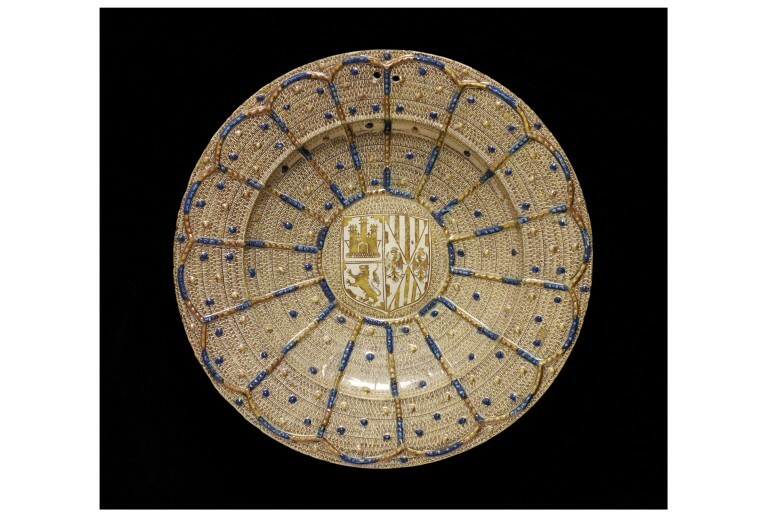 The arms on this dish are those of Isabella of Castile and Ferdinand as King of Sicily, which suggests that the dish was made between 1469, the year of their marriage, and 1479, when Ferdinand came to Aragon. 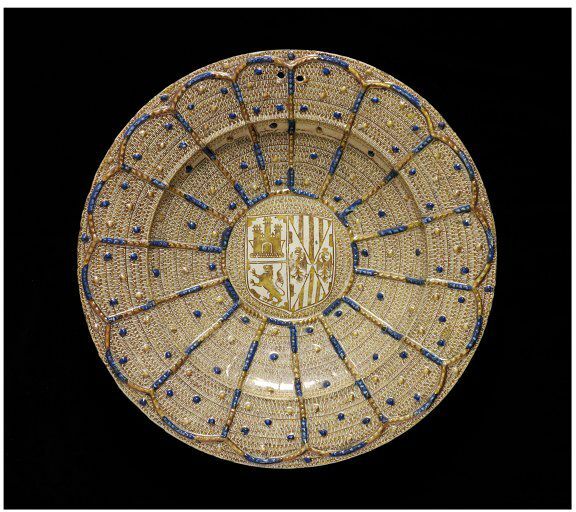 The function of this large dish was probably as a basin, which would have been used with an accompanying ewer for hand-washing at the table, before and in between courses. The splendid decoration in lustre as well as the two pierced suspension holes suggest that the dish was probably also used for display purposes. The relief decoration imitates pearls and gold wire rolled to resemble beads. This deliberate echo of jewellery ornament makes this golden dish even more like precious metalwork. Two pierced holes for suspension through the rim. The arms are those of Isabella of Castile and Ferdinand as King of Sicily, which suggests that the dish was made between 1469, the year of their marriage, and 1479, when Ferdinand came to Aragon. Historical significance: Spanish lustered pottery was by far the most sophisticated kind of ceramics produced in 15th-century Europe. It was much in demand by Spanish noble families, but also exported to Italy and other countries. 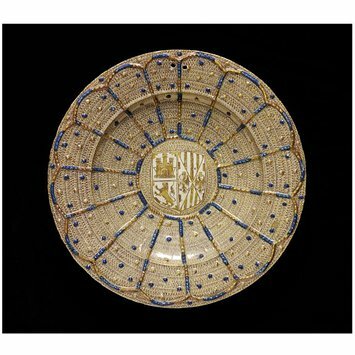 The function of this large dish was probably as a basin, which would have been used with an accompanying ewer for hand-washing at the table, before and in between courses. The splendid decoration in lustre as well as the two pierced suspension holes suggest that the dish was probably also used for display purposes.